Recently we released Passcovery Suite 3.3, and in addition to support for NVIDIA Pascal architecture, announced more convenient operation using offsets when recovering passwords for various TrueCrypt volumes. What are these offsets, what values so they take, and what is their advantage in working with Passcovery Suite? The answers are in this note. The essence of password recovery reduces to the fact that the program sequentially takes passwords from a specified data set of values, carries out the necessary transformations over the password, and verifies the result using reference data from the protected file. As soon as they coincide, the password has been found. And so, regardless of the size of a TrueCrypt volume only 512 bytes of data of the protected file are necessary to check the validity of a password. This data is not always in the very beginning of the file. The position in the file depends on the TrueCrypt volume type. The value by which the necessary data is displaced from the beginning of the file is called the offset. In Passcovery Suite, operations with offsets are organized through a drop-down list: at the stage for creating a password attack, it is sufficient to choose the appropriate type of TrueCrypt volume. The program will display the applied offset value which will be used to break the TrueCrypt password. When needed, it is also possible to specify a non-standard offset. For this purpose there is a ”Custom” item in the drop-down list and a field for inputting an offset, which is activated by selecting this item. The value can be entered in both hexadecimal and decimal. Passcovery Suite supports various types of TrueCrypt volumes with all their various encryption and hashing algorithms, and due to enhanced code optimization and AMD and NVIDIA GPU support, the program guarantees an always high recovery speed for TrueCrypt passwords. 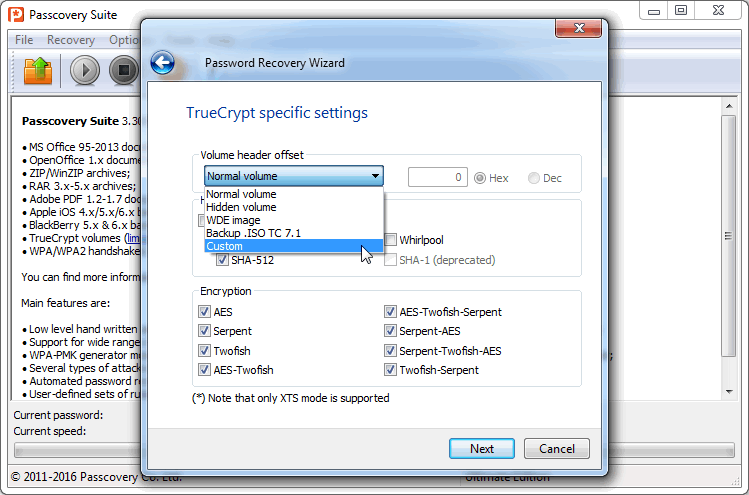 Related articles How can I organize a password search for full TrueCrypt devices/partitions?